Everywhere you look, people are walking around with flawless lashes. From the runways at New York Fashion Week to the city streets, people are tossing their false lashes and eyelash curlers aside and turning to professionals to obtain full sets of long, lush and curled lashes without extending their makeup routines. Here's how you can wake up to enviable eyelashes without spending extra time in front of the mirror. A lot can go wrong when it comes to false lash application: they can be hard to get straight, even harder to line up with your natural lash line and messy glue can run into your eyes. Eyelash extensions take all of these out of the equation. Eyelash extensions are artificial lashes that are added to existing natural eyelashes to enhance fullness and length. Unlike at-home self-adhesive strip lashes, eyelash extensions last about a month and don't require daily application which makes them perfect for anyone who hasn't perfected false eyelash application or is looking to streamline their makeup routine. Eyelash extensions come in a variety of materials, sizes, and patterns and are often customizable to fit your style. They are typically made of synthetic materials, silk, or mink. Mink lashes are the gold standard though synthetic lashes can give you a similar look without shelling out as much cash. It takes around two hours for a lash stylist to apply the new lashes and since each lash extension is attached to a natural eyelash, they will fall out over the natural growth cycle of each lash. It is generally recommended to get touch-up’s every three to four weeks. Once a set of eyelash extensions has been applied, you must keep your face water-free for at least 24 hours. Contact with water can weaken the adhesive and cause eyelash extensions to fall off. This means you will have to be extra careful washing your face and in the shower. Mascara and other eye makeup can clump at the base of the extensions, but you can carefully apply mascara to the tips of your lashes to make your eyes pop. Use a small spoolie brush to comb out any criss-crossed eyelashes to give them more definition and fullness. To find a reputable specialist or lash studio, read reviews online, look at before and after photos, and talk to friends for references. Just like a perm turns straight hair into luscious curls, an eyelash perm is a semi-permanent way to curl natural eyelashes. First, the lash stylist uses makeup remover to ensure the eye area is clean and then applies a gentle adhesive to the eyelids to protect the skin from contact with chemicals. Next, the stylist will use a tiny eyelash roller to mold the eyelashes to the desired curl: the bigger the roller, the larger the curl. A chemical solution is applied to the lashes to break down the disulfide bonds in the hairs, which allows them to curl around the roller, and sits on the lashes for about 15 minutes. Afterwards, a second solution is applied rebuild the broken-down disulfide bonds, which takes another 15 minutes. The liquid treatments are then washed off and the lashes are brushed out with a miniature comb to ensure they do not stick together. Finally the newly-curled lashes are conditioned to keep them healthy and hydrated. Like a hair perm, the eyelashes cannot get wet for 24 hours after the treatment. The entire process takes under an hour and lasts up to a month. However, the treatment can work better for some than it does for others. 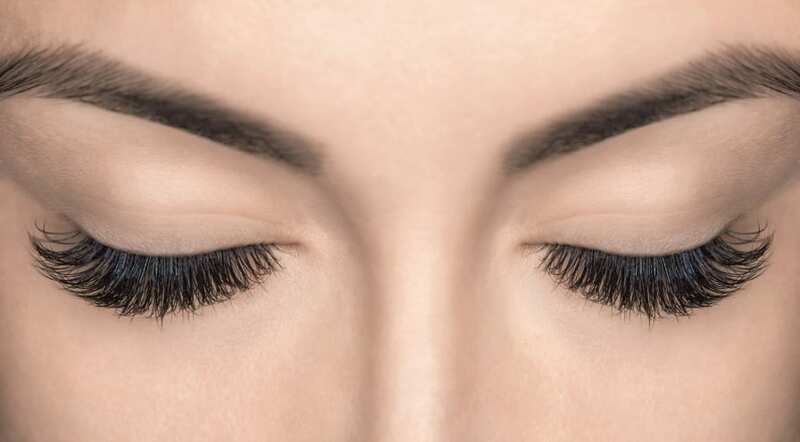 Since the process curls the existing eyelashes, lash perms are best for people with long lashes as the treatment can make natural eyelashes look shorter than they actually are. Like an eyelash perm, there are different sizes of silicone pads to choose from. The same two chemical treatments are applied and post-treatment guidelines are the same: no water or mascara can make contact with the eyelashes. Perhaps the biggest difference between an eyelash perm and a lash lift, however, is that a lift will last longer: around six to eight weeks. As the name suggests, a lash tint is changing the color of your eyelashes with a product like hair dye. Though it is not going to change volume or length, a lash tint is a great option for anyone who does not want to wear mascara. There are different colors to choose from depending on your complexion. The most popular color is blue-black, which is typically the darkest and great for those who have dark hair but lighter eyelashes. Lighter blacks or browns are also available for those with lighter coloring. Once you have decided on the color, the technician will place a protective pad under your eyes and start applying the dye to the lower lashes (say hello to clump-free bottom lashes) then the top. The dye needs to sit on the lashes for about 10 minutes to work effectively and the average treatment takes less than half an hour. Some people who have dry eyelids may experience a mild stinging sensation during the treatment, but it is harmless. To prevent stinging, apply a small amount of oil before the tint to lubricate the eyelids. An eyelash tint lasts anywhere from three to four weeks, depending on the person. To extend results, it is recommended to apply serum to the eyelashes to keep them hydrated and avoid rubbing eyes or pulling off mascara. If visiting a salon is not your thing or if you are looking for a more economical and gradual option, lash serum can be the answer. There are many different lash serums to choose from and while each serum boasts something different, the common goal among all of them is to enhance lash length, fullness, and growth. Most lash serums need to be applied daily to maximize effects. While it can sound like high maintenance, coating the base of your eyelashes with a serum is a quick and painless process that can easily be integrated into your morning or evening routine. Depending on the serum, lashes can become longer and fuller within a few weeks and it might take some trial and error to find which serum works best for you. Before making an investment, inquire if there are samples you can try to find the one that works for you.